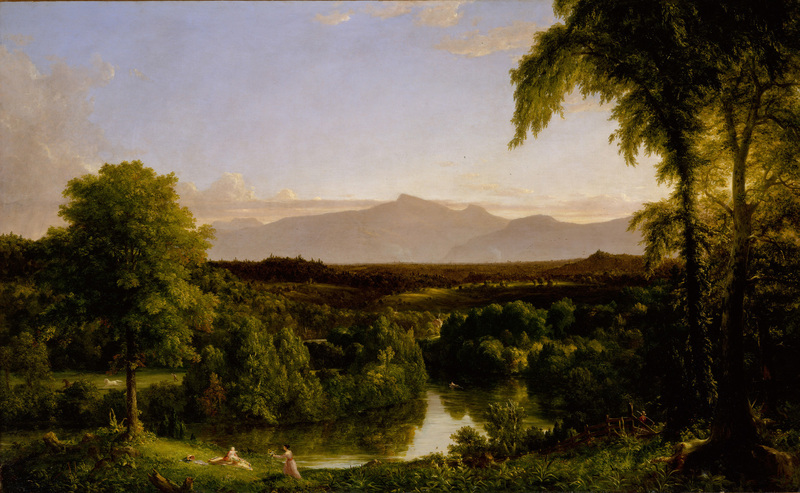 Thomas Cole, View on the Catskill--Early Autumn, 1836-37. Oil on canvas. The Metropolitan Museum of Art, New York. Gift in memory of Jonathan Sturges by his children, 1895. Thomas Cole (1801-1848), born in Bolton, England, is credited, in the Met’s recent exhibition, with bringing the genre of the sublime landscape painting to the United States. Having immigrated to the US in 1818, he travelled back to England, and later on to Italy, to study art and master the picturesque on-site sketch. Back in the USA, he became reputed for his large-scale landscapes which idealize the preservation of the American wilderness. Looking at his work’s connections to European Romantic painting and other material cultures served as a fantastic way into appreciating the Met’s permanent collections of 19th-century American landscapes, which are quieter rooms in this huge institution but worth visiting. I wanted to know how well Thomas Cole is known in the USA – had I not heard of him because of my focus on the European eighteenth century, or was his reputation being revived by this huge Met show for the US canon? For a snapshot of views, I asked people who happened to be sitting next to me in an exhibition room, whether people would generally know of him here. “No, not unless you’re into art.” They went on to explain that Cole might be better known in the North East of the USA, because his paintings are grounded in these local landscapes. In the conversation, the kind stranger mentioned that they had only heard of Thomas Cole through teaching about him (brilliant, I thought, I’ve asked the right person). More well-known figures in the American Romantic landscape canon, they explained, include Edmund Church, George Inness, Albert Bierstadt, and Asher Brown Durand. Some of these artists’ work is in the permanent collection of American landscape at the Met, whereas this exhibition seemed to focus on Cole as a foundational figure who brought the landscape painting genre to the US, which he then interpreted for the American context. The introductory video in the first room (narrated by Sting) describes Cole as an “economic migrant” who established the first national landscape school. What was really lovely to see in the exhibition was the focus on not just large-scale paintings but also Cole’s background in other art and material culture forms. At the start of the exhibition was a pattern book of dress fabrics, with the exhibition text explaining that Cole “first honed his skills in design and execution as an engraver of wood blocks” for fabrics used for women’s dresses. From Bolton, Cole moved to Liverpool in 1817 where he was apprenticed to an engraver, and the role of prints in his artistic development is also recognized. An example is John Hill’s The Hudson River Portfolio, 1821-25, a book of aquatints, which is credited with introducing picturesque landscape conventions to the US, and promoting picturesque tourism to the sites it illustrates. John Martin’s “The Deluge”, 1828, mezzotint with etching, is an incredibly exciting work for its beautiful line work, and it was nice to see Cole’s huge Academy oil paintings shown in parallel with prints which have more character. It’s also interesting to see Turner’s paintings alongside prints such as “The Deluge” – it brought out that Turner’s work is not a move out of the blue to supposed abstraction, but rather that his emphasis on line and movement was shared with other mediums and genres from the period, such as what is made possible by mezzotint. The gallery text says that Martin’s landscape prints were widely available in 1820s New York, so the link between UK and US cultures is emphasized even before we get to the rooms about Cole’s travels to the UK and his Italian Grand Tour. The focus on processes continues. Constable’s oil sketches which are included are generally described as “among his greatest achievements”, and the exhibition moved on to Cole’s own education in preliminary plein-air sketching and in graphite and oil studies. Later in the exhibition the material focus was again the highlight: Thomas Cole’s 1832-41 mahogany sketch box survives, and despite studying picturesque landscapes I had never seen a ‘Romantic’ one or what it contained. It’s a very bulky thing, a bit larger than a briefcase, and the rim is designed to hold the wet sketch. The pigments are in little bags that look like coin purses tied with rope, and are made of animal bladders. Cole’s own paintings are highly moralistic and not experimental. The room which charts his UK stay tells of how when he met Turner, he didn’t like him because he wasn’t well dressed, and he also didn’t like Turner’s radicalism. So Cole made huge generic paintings, like a series called “The Course of Empire”, 1833-1836, which narrates the rise and fall of civilization, and which the exhibition text interprets as being a moral call to America to preserve its nature. Some of his later paintings are more subtle, with “View on the Catskill—Early Autumn”, 1836–37, only pointing to mild intrusions made on the landscape by a human presence and building. The people I talked to at the exhibition told me that there is a Thomas Cole Museum close by, if you take the train from the central station to Hudson. The trip would also let you see the specific landscapes, which I get the impression are important to the national side of Cole’s reputation. He is credited for making landscape an important genre in the US. It is also nice to see, as an eighteenth-century-ist, that I was being advised by locals that seeing the landscapes and the sites was really important to appreciating these paintings. This made the journey of the picturesque guidebook form as well as picturesque tourism across the Atlantic feel present. Cole’s followers are represented in the American Wing of the Met Fifth Avenue; overall it is worth looking at Cole and his followers’ work to see how the landscape genre travelled and developed. Thomas Cole’s Journey: Atlantic Crossings was at the Metropolitan Museum of Art, New York from 30 January to 13 May 2018.